Planners have a unique ability to consume information and address both policy and practical issues on a variety of scales – from neighborhood to regional to international. The use of information technology, specifically geographic information systems, continues to expand the planners’ toolkit. Applying these tools requires planners to go beyond synchronous inductive and deductive reasoning and move towards ‘integrated thinking’. Spatial literacy allows citizen planners to question and advocate for public policies based upon community data that has not been readily available to decision makers in municipal government. 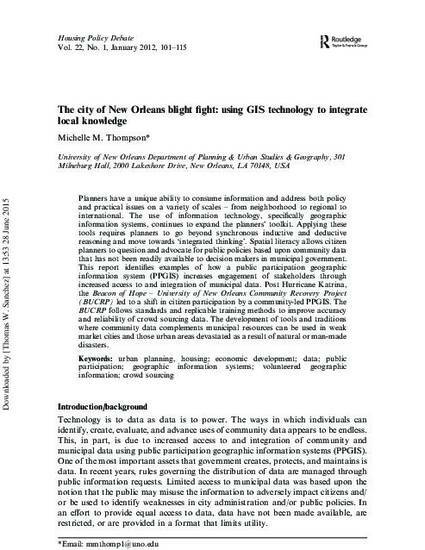 This report identifies examples of how a public participation geographic information system (PPGIS) increases engagement of stakeholders through increased access to and integration of municipal data. Post Hurricane Katrina, the Beacon of Hope – University of New Orleans Community Recovery Project (BUCRP) led to a shift in citizen participation by a community-led PPGIS. The BUCRP follows standards and replicable training methods to improve accuracy and reliability of crowd sourcing data. The development of tools and traditions where community data complements municipal resources can be used in weak market cities and those urban areas devastated as a result of natural or man-made disasters.